This simple Flash animation about the states of matter will help the student visualize particles, as the temperature is increase. The temperature vs. time graph helps the student visualize the "plateau" when there is a change of phase (at the melting point and the boiling point). 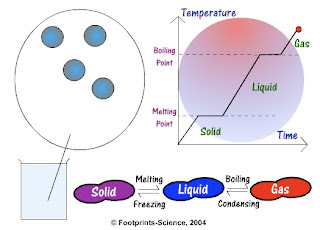 There are also arrows to show how changes of phase are called (melting, freezing, boiling and condensing). Unfortunately, sublimation is missing.